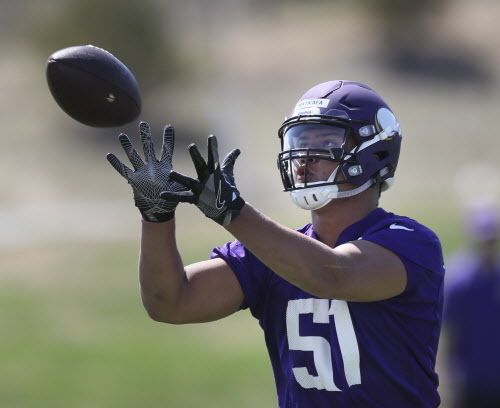 The Vikings put defensive end Hercules Mata’afa, who tore his ACL during organized team activities, on the waived/injured list on Wednesday, signing linebacker Mike Needham to take his place on their 90-man roster. The Vikings put defensive end Hercules Mata’afa, who tore his ACL during organized team activities, on injured reserve Thursday, a day after signing linebacker Mike Needham to take his place on their 90-man roster. The team had initially put Mata’afa on the waived/injured list, but said on Thursday morning it was able to place him directly on injured reserve thanks to a new league rule that no longer requires teams to put injured players through waivers. The Vikings’ roster is at 90 players with the addition of Needham, while Mata’afa remains under team control. Needham, a Southern Utah product, signed with the Cardinals as an undrafted free agent. The team released the 6-foot-3 linebacker after its rookie minicamp.